NEW YORK (CNNMoney.com) -- In a unanimous vote Wednesday, product safety regulators agreed to ban the production and sale of drop side cribs in the United States. The Consumer Product Safety Commission voted 5 to 0 to implement a new federal crib safety standard that does away with the traditional drop side crib design. The ban goes into effect in about six months, or by June, said CPSC spokeswoman Patty Davis. Davis said the new regulation also enforces stronger crib mattress and sturdier hardware and more rigorous safety testing of cribs. Dozens of infant deaths over the past decade have resulted in recalls of millions of drop side cribs in the United States. The agency said between November 2007 and April of this year, there were 36 deaths associated with crib structural problems after babies became entrapped and suffocated. Retailers and manufacturers have already been phasing out the traditional drop side cribs, Davis said. 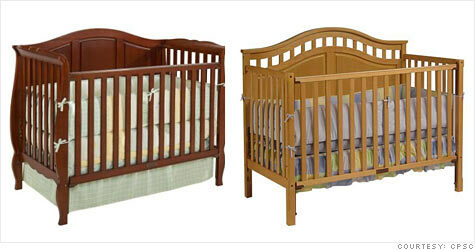 When the new rules go into effect, they will no longer be allowed to make or sell this style of cribs, she said.